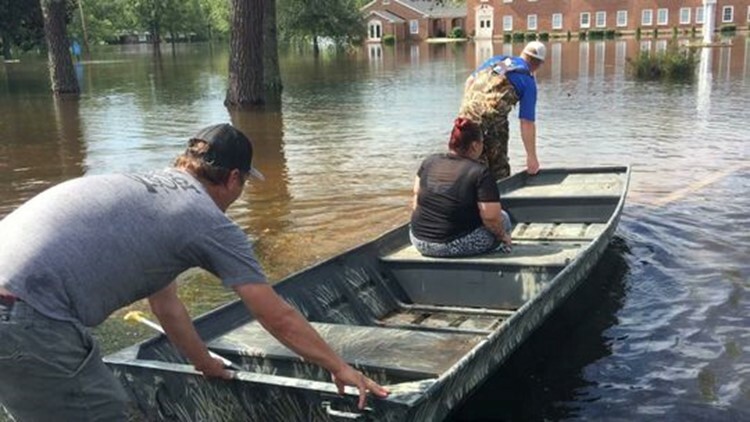 Jess White and Allen Anderson guide Sarah Brown back to her now-flooded home using a boat in the Long Avenue neighborhood of Conway on September 17, 2018. 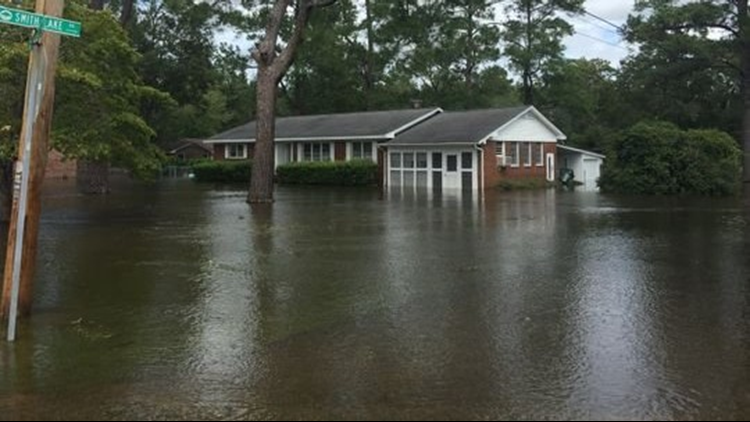 A nearby swamp has flooded, bringing water into the neighborhood following Hurricane Florence. When you have two "1,000-year" floods over a three-year period, it's time to rethink your definition of normal. When you have two “1,000-year” floods over a three-year period, it’s time to rethink your definition of normal. What happened along our coast earlier this month is going to happen again — and it won’t take 1,000 years. We need to prepare for it. Rebuilding every couple of years is not sustainable. After Hurricane Irma last year, I came up with an idea for how to harness and redirect these monster storms. It was far-fetched, probably even ridiculous – although I still believe that someday technology will advance to the point of being able to keep hurricanes away from the mainland. This time, I've been trying to come up some short-term solutions to dealing with floods, since it seems more likely that something could be done about this specific problem without requiring any quantum leaps in engineering. Building reservoirs — basically areas that are already flooded and can hold a lot more excess water — seems like an obvious solution. Since traditional reservoirs, like Lake Hartwell, require taking over a lot of land. I decided to go with a less invasive approach: Build them underground. That way, when the floodwaters come, you just open up the bottom of several sections of the Great Pee Dee and the Waccamaw and other flood-prone rivers and let the excess water drain into vast caverns that you have excavated. As a side benefit, you would have plenty of water in reserve for when the drought returns. And since one underground reservoir wouldn't be connected to another like in most above-ground lake systems, you wouldn't have to worry about downstream impacts. A house is flooded on Busbee Street in Conway on Monday, Sept. 17, 2018. I don’t know how much it would cost to build such a system, but over time, the expense would be offset by the savings from the loss you would have had from flooding. Of course, that’s just an idea – and maybe a crazy, impractical one. To find out what might really work, I went to Clemson University’s Ashok Mishra, an associate professor of civil engineering who has expertise in this area. As you may have guessed, he didn't think underground reservoirs would be practical. Well, I think it might just take a lot more of them than he thinks would be feasible. But even building big reservoirs, like the chain of lakes we have on the Savannah River basin, including Lake Hartwell, is not necessarily a good solution, he said. That’s because of the complexities of coordinating the flow from one reservoir to the next one below it and so on. You need to be able to know in advance, with a high degree of confidence, how much rain you’re going to get, and there needs to be better communication between forecasters and stakeholders, he said. Then there’s the problem of smaller dams holding up during extreme rainfall events. During the flooding of Oct. 1-5, 2015, some areas of the state got more than 20 inches, and 36 dams failed. Dams and levees also can make the matters worse by disrupting the flow of water away from flood-prone areas. "Therefore, there is a need for communities to develop flood control solutions that provide more storage in the watershed," Mishra said. The first step to finding solutions is to understand better where the most high-risk areas are under various storm scenarios. Mishra has applied for a grant from the National Science Foundation to develop a statistical modeling framework that could be used to generate maps identifying critical vulnerabilities of important coastal infrastructures. That involves mapping the high-water mark left by Tropical Storm Florence and determining how much flooding was caused by storm surge and how much by rivers overflowing. And yes, Mishra says the increase in big storms we’ve seen in recent years is related to climate change. “Several different studies concluded the onslaught of rain was brought on by global warming,” he pointed out. And it’s going to continue. Increasing urbanization of coastal areas also is going to make flooding worse because it prevents the natural absorption of water into the ground. “If we keep building in the flood plain areas, the water has nowhere to go,” he said. Mishra mentioned one idea that seems to hold promise: Build more detention ponds, in the right locations. “It is being done, but the most important thing would be to use sensors and see how much water is going in all the ponds and see how that can be coordinated,” he said. It might not be pretty having lots of detention ponds looking like mudholes most of the time, but it would be worth it if it can keep the water away from homes and towns. But I’m left still looking for the Big Fix. It may be beyond our capabilities now – but I think we need to think big and keep working at it. Our future may depend on it.